Not too long ago I came across this truly inspired recipe for a savoury asparagus baklava on innBrooklyn that sounded so amazingly good that I just had to try it! This asparagus phyllo pie is constructed like baklava with layers of light, flaky golden brown phyllo alternating with the layers of a walnut and asparagus filling and a cheese filling. Given the layers of cheese in this pie, it also reminds me of a lasagna, only made with phyllo instead of noodles. The combination of the cheese and the asparagus also made me think of spanakopita , a Greek spinach and feta pie that is another savoury pie made with phyllo and I could not resist swapping some feta into the recipe replacing some of the mozzarella. Continuing to be influenced by spanakopita I wanted to use some fresh herbs and dill seemed like the perfect choice. 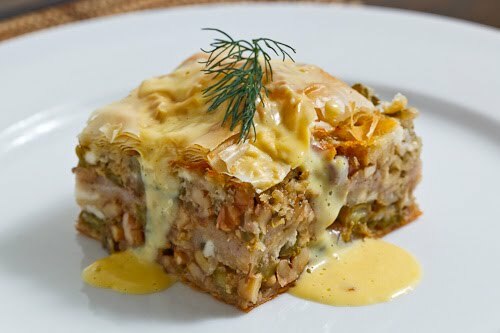 Baklava is normally drenched in syrup and this savoury version does not forget about it but in this case the ‘syrup’ is an avgolemono sauce . An avgolemono sauce is a Greek sauce made with eggs and lemon. Although avgolemono sauces normally use a whole egg, I decided to stick with just the egg yolks to give the sauce a richer yellow colour. Although this recipe is pretty easy, assembling all of the layers is a bit time consuming but it is definitely worth it! The asparagus phyllo pie was everything that I had been hoping for and more! You really cannot go wrong with light flaky pastry filled with asparagus, cheese and nuts! I had been a little worried about how all of the walnuts in the recipe would work out but they were quite nice and the contrasting textures added a lot to the dish. I really enjoyed the dill and lemon flavours and the lemony avgolemono sauce finished off the dish perfectly! What a great way to enjoy some of the in season local asparagus! Rinse the asparagus under cold water to stop the cooking process. Cut the asparagus into pieces roughly the size of the walnuts. Mix the asparagus, garlic, lemon zest, dill and walnuts in a bowl and set aside. Brush the top of a sheet of phyllo pastry with olive oil and place it in a greased 8 inch square baking pan. Repeat 5 more times. Spread half of the asparagus mixture over the phyllo followed by half of the cheese. Repeat another layer of phyllo, asparagus and cheese and top with a final layer of phyllo. Cut the pie into pieces shaped as you like. Bake the pie in a preheated 350F/180C oven until golden brown on top and bubbling on the sides, about 30-45 minutes. Pull the pie out of the oven and let it cool. Whisk the egg in small sauce pan until frothy. Whisk the mixture over medium heat until it thickens, about 5-10 minutes. Plate the phyllo pie and drizzle with the avgolemono sauce when ready to serve. I would have never thought about a savory baklava. This looks so delicious! this looks too complicated for me to make, but it does look good & tasty! This sounds amazing. In Greece we would call this a "pita" as pies are made with vegetables, cheese and phyllo. I am a little bit skeptical about the avgolemono sauce. I love the idea of an asparagus baklava! Very, Very interesting and delicious recipe. Stunning, Kevin! I love the savory phyllo pies and this is wonderful! I love the avgolemono sauce drizzled over the whole. Wonderful flavors! Beautiful pie! That is a fabulous creation! It looks so scrumptious. I honestly can't stop looking at this. it is one of hte most decadent and beautiful things I've ever seen! Amazing. Good grief! That just might be one of the most beautiful things I’ve ever seen. I’ve never attempted something like this but I think that’s going to have to change. Great post! This dish is just stunning Kevin and with the avgolomeno it is over the top. I read all the days your blog. It's delicious. This recipe is very original. Cheers from a Spanish in Norway!! A savory baklava!? I should have expected something like this from you kevin! Looks so tasty! I need to try this! Una estupenda receta. Enhorabuena por tu fabuloso blog. Es una maravilla. I really love to see the creations you make that come from traditional Greek dishes. This looks fantastic and uses one of my favorite green veggies so it is a must try on my list now! this looks just amazing! I'm a massive fan of savoury baklava, but have so far only made one version (with tomato, feta, cinnamon onions and dried dates). I'll have to try this one! This idea is seriously genius! Looks delicious! Oh my goodness I've never even conceived of such a thing!! But now I must have it. This looks so so amazing Kevin. I must say, I did not see this one in Greece! You are so creative! This looks fantastic, I have been looking for a recipe using phyllo dough in a creative savory application for a long time!